Thank you Linda Giordano and Chief Carl Dabadie for choosing Personalized Gifts Inc to supply your officers and retired officers with personalized license plates. Personalization options are - text in arc on shield and two lines on the plate. You may view this badge larger by putting the mouse over the above. You are given the option to set up the text on top arc of the shield, and also both lines of text on the plate. For your safety, a commission must be presented for purchase. You may email a copy of your commission to pgi [at] personalizedgiftsinc.com after you have checked out. Arc On shield ex: Officer, Sergeant, etc. Personalized Plates are white Aluminum specially coated to accept your imprint. Imprint will not wash or rub off. 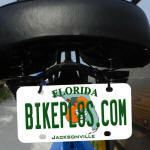 Plates ship with 2 zip ties, however, please follow directions from your bike or Auto manufacturer for application. Please take care not to over tighten any fasteners. Guarantee: Any item that is damaged in shipping can be exchanged for an identical item with the same personalization. However, a claim must be made with the freight carrier. Please check shopping cart carefully for accuracy before submitting as personalized products cannot be returned or refunded.